The Power of Produce research study was developed to help produce retailers, growers and processors learn and understand consumers’ shopper habits and most importantly, turn them into actionable insights to drive sales. In this ebook, we provide you with the Top 10 insights to The Power of Produce 2017. Enjoy! Fill out the contact form below to receive your Power of Produce Top 10 findings eBook instantly! 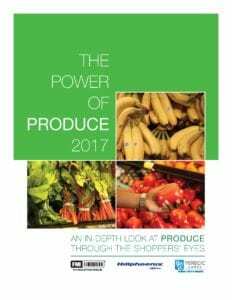 The Power of Produce is an annual research report published by Food Marketing Institute, conducted by 210 Analytics, LLC and sponsored by Yerecic Label and Hillphoenix.